Now We Can’t Trust the FTC to Protect Consumers? HERB GREENBERG: What kind of a business is it if 90% of 2.7 million every year– right now we’re talking 2.7 million distributors for one company. DAVID VLADECK: It doesn’t mean that– that– that doesn’t mean that the company made misrepresentations. And it doesn’t mean that the people who– who bought these– franchises or participated in these schemes necessarily feel that they were injured. I– look, I don’t know what the failure or success rate of new businesses are in the United States. But it is not high. The first thing that stood out to me is the way Vladeck puts the pressure on consumers to complain. Why can’t the FTC take a proactive approach to protect consumers before they are harmed? Notable in Vladeck’s response is that is that people might not “necessarily feel that they were injured.” So the implication here is that the FTC is fine with consumers being victimized by a pyramid scheme as long as they don’t know it. Consumers are under the assumption that the FTC would shut down an illegal pyramid scheme. Thus they assume they were in a legit MLM, and have no reason to complain to the FTC about being a victim. The FTC is under the assumption that consumers are educated enough to know the difference and will actively seek out the FTC to complain. It’s a stalemate. The result is what you see with Fortune Hi-Tech Marketing defrauding hundreds of thousands of customers out of hundreds of millions of dollars over ten years. I know I’m Lazy, but come on FTC, read your own mission statement: “prevent business practices that are anticompetitive or deceptive or unfair to consumers.” What’s wrong with acting proactively to protect consumers before they are defrauded out of their money? 90% of People Failing = Pyramid Scheme? If we are to compare this against a business where 90% are failing every year, it is drastic. If we start with a 100,000 people and 90% fail each year, you have 1000 people after two years. That’s a 99% failure in MLM vs. 30% in traditional small businesses. After 5 years, you are left with a single person in MLM instead of the 50,000 that you’d have with a traditional small business. Mr. Vladeck, the success rate of new businesses in the US is sky high in comparison with MLM and in particular HerbaLife. There’s a petition to get the White House more involved with stopping pyramid schemes before consumers get defrauded out of tons of money. Sign it and spread the word and let’s see if we can get some positive action to help consumers. I got an email recently suggesting that I expose a dark underbelly of the dark underbelly known as MLM. When it comes to MLM, it’s probably more appropriate to call it an onion of evil. You pull off one layer and there’s another one underneath. I’ve written before about The Business of MLM (or What Gives Freddy Krueger Nightmares). What I forgot to mention in that article is the MLM tool scams… which is like inviting Jason Voorhees and Michael Myers to the party. [Side Note: I’ve borrowed the “ScamWorld” in the title from this excellent, but very long, article on get rich quick Internet schemes from The Verge. Back to the email I received. The person mentioned an old “friend”, Chris Blair. Mr. Blair introduced me to LifeVantage Protandim, just weeks after spamming me to join his coin MLM. (I didn’t realize until recently that he was in MonaVie, which is another company I covered also.) The person mentioned that Mr. Blair is on a full-fledged MLM marketing mission leaving no stone unturned. He’s now putting videos up about the Empower Network, Neucopia, and Network Marketing VT… three MLMs whose “product” are “tools” that are used by other MLMers. Let’s take a look at the last one, Network Marketing VT, as pitched by Chris Blair. It offers a few conference calls and training webinars, a “huge” library on business building and lead generation, “enormous” product suite of software, etc., but most importantly it includes a pyramid scheme where if you recruit 200 people to buy the same course you can make nearly $20,000 a month. And of course Chris Blair calls it “the greatest thing I have ever seen”, but if you read the other two, he says similar things about them as well. Let’s expose the Neucopia scam becuase it is fun. Also, since I’m Lazy, I love things that are easier than shooting fish in a barrel. And exposing Neucopia is a whole lot easier than that. Two of the first tools are Internet Marketing Articles and Copywriting Automater. Internet Marketing Articles is a way to clog the Internet with a bunch of what Google calls “thin-content” or essentially spam webpages designed to fool search engines into thinking you are popular. The Copywriting Automater creates these articles quickly. Who cares if they read like they’ve been translated from Russian to English back and forth a few times? It’s not for humans to read anyway. You’ll so others like payment button creator, iframe generator, and audio player generator. Paypal has very simple and free tools to generate a payment integrated in their site. Enter iframes in your favorite search engine and the first result is going to show you the one line of code to generate an iframe. I used a YouTube’s embed feature to generate a video player, so I’ve already one-upped the audio player generator. Of course many of the tools have pictures of fake software boxes beside them, so you may be confused into thinking that people actually pay for this stuff. Access to these basic level tools is going to cost you $50 a month with Neucopia. Also with the basic level of Neucopia membership, you’ll learn Real Estate Training (cue Tom Vu), Stock Market and Forex Trading (because there’s no quicker way to lose money than trading stocks and currency from the advice of non-financial company), debt consolidation (where they’ll likely spin you to company to turn your unsecured debt to secured debt where you could potentially lose your home), and tax avoidance tips (because its always wise to mess with the IRS). However if you want to plunk down $270 to start and $170 a month ($2000+ a year) you’ll get access to the premier level of Neucopia. What does that give you? The key thing they pitch is “top level guru” videos. The first thing I notice is that they didn’t give you one for the month of November or December, so that was 100% waste of your Neucopia premium dollar. Interestingly, I’ve never heard of Mia. So I decided to search Forbes site for Mia Davies and USA Today’s site for Mia Davies and came up with no results. It was time to dig deeper and Mia Davies’ own website gives us the proof. There we see a number of screenshots. If you look carefully at each of these, they are syndicated press releases from PR Web. Essentially Mia Davies put out this press release about herself. At least you get someone who shared a stage with “T Harv Eker” whoever that is. Final Thought: Do these tools really help people make money? I’ve shown that well over 99% of people lose money in MonaVie and the the stats are similar for just about every MLM that makes the data available. As one reader, Jim, pointed out, in MLM It’s Not a Matter of Effort, Failure is a Mathematical Certainty. Like a game of poker, if you play long enough, there’s going to be one winner and the rest losers. It doesn’t matter how good the poker players are since they are all in competition with each other. In MLM, it is the same way, since they are all trying to recruit people, and there’s a limited set of people who would fall for the scams. In some ways, I almost buy the sales pitch that MLMers need these tools. The success rate in MLM is very close to zero because the competition is literally millions of people looking to recruit the few people left who are susceptible to the scams. One could say that an MLMer needs every advantage they can get, but paying thousands of dollars a year pushed the success rate that much further out of reach. It’s a game where they realize they’ve got a distributor brainwashed, so might as well soak them out of as much money as possible. A Few Hundred on the Side With No Time for Work? If you scroll down this website and look at the right column, you’ll see a section of “recent comments.” At any given moment, you’ll see that a vast majority of them are on my articles about multilevel marketing (MLM) scams. Most of the comments from MLM distributors defending what I’ve shown to be pyramid schemes using the FTC guidelines are laughable to the point that there are a few people who subscribe to comments for entertainment value alone. I wouldn’t exactly call myself a finance expert. Even in my niche of finance, personal finance, I still have plenty to learn. Aside from that, there’s a lot going on in that single sentence. My first thought was that I hope that JeffM realizes that MLM is a part-time job. In fact, in many cases it is another full-time job, one that pays less than minimum wage on average. In previous comments, he had said said that the people who fail are the ones that don’t put in the work. I doubt he’s found a magical time machine that allows him to do all that work in no time. It doesn’t add up. Time and again, I’ve heard how much time MLMs distributors put in. It’s quite common to see them marketing their stuff on social networks. You can see them spending their evenings and weekends at brainwashing training conferences. Finally, you can look at just about any MLM’s income distribution statement and see the average hours worked by distributors… the number is never zero. From all this, one thing is abundantly clear: If you don’t have time for a part-time job, you don’t have time for MLM. It saddens me that people like JeffM could use this kind of marketing to draw people in so that they can profit off them. With that MLM myth blown up, let’s look at the more important part… making money. If you were looking for a more complete solution, I suggest that you check out Get Rich Slowly’s Make More Money: How to Supercharge Your Income. It covers such great ideas like how to Maximize Your Salary, Take a Second Job, Become Better Educated, Make Money from Your Hobbies, Start a Side Business, Start a Website (or a Blog), Become a Landlord, Sell Your Stuff, and Get Creative. There are several things in here that don’t answer what JeffM is looking for, but considering that his question is unrealistic, it makes sense to go with the best realistic ideas. The idea of making money from your hobbies is a great one and is probably the best workable solution to JeffM’s question. Finally, I would suggest saving time and learning how to be more productive. That way you create the extra time to earn extra money. Books like Getting Things Done and Never Check E-Mail In the Morning are great. In addition to those, there’s my list of ways to save money… recognizing that a dollar saved is a dollar earned. If you decide that starting a business is right for you I’ve got a few tips here, but I particularly liked Millionaire Fast Lane by MJ DeMarco as a great book on entrepreneurism. The short, common sense answer is to JeffM’s question is that there is no simple answer on how to gain a few hundred extra without putting in some time. In order to make money others have to be willing to give you theirs. They typically don’t do that unless you provide them with value. Providing people with value takes your time… and there’s nothing wrong with that. A better question for JeffM would be, “What value does MLM provide people?” I’ve seen inanimate objects like a shelf at Wal-Mart or a virtual space like Amazon sell products and they do it much better than MLM. The short answer is yes. The longer answer? It is perhaps the most incredible example of deceptive marketing in the history of mankind. What I’ve found is tons of irrefutable evidence supported by reputable third parties that MonaVie is a grossly overpriced product, with little nutritional value, wrapped in a poor business opportunity that appears to be illegal pyramid scheme, supported by nonsensical “scientific” studies and illegal medical claims. That’s a lot to digest. I’m going to give you a minute to re-read that. Typically when people are interested in MonaVie, they are focused on two things: 1) The nutritional value of the product and 2) the business opportunity. After all, the promise of MonaVie marketing is health and wealth for you and all your friends. Many of MonaVie’s claims come on something called a ORAC value. It’s a lab test that measures anti-oxidants in food. On the face of it higher ORAC seems better, but there’s a lot more to it than that. I’m not a doctor, so I’m not going to try to explain ORAC to you. However, Dr. Jonny Bowden explains that MonaVie doesn’t cure cancer and gives great detail about ORAC in the process. There are a couple more issues with regard to MonaVie an ORAC values. High on the list is that MonaVie lies about the ORAC score of MonaVie. They published two widely different scores. Many distributors make the claim that drinking 4 ounces of MonaVie is like eating 13 fruits and thus is a way to save money. This is a huge lie. MonaVie put out marketing material that said it “Delivers the antioxidant capacity of approximately 13 servings of fruits and vegetables in just four ounces.” MonaVie set up a the classic telephone game where the initial message conveyed changes as it passes through the downline and the words, “antioxidant capacity” get left out. In this statement, the antioxidant capacity is measured ORAC value, and the equivalent fruits and vegetables are not even mentioned. A MonaVie product specialist cleared this up when called, but MonaVie didn’t issue a clarification or change its website for years… see more at Drinking MonaVie is Not Equal to Eating 13 Fruits. To follow up on the above, a single apple has the antioxidant capacity of 9.5 ounces of MonaVie. If a person was relying on four ounces of MonaVie to give them the equivalent of 13 fruits, they are making a huge nutritional error as 13 apples has the equivalent ORAC value as 123 ounces of MonaVie. MonaVie Original retails for around $1.48 an ounce, so that’s around $182 of juice for the equivalent antioxidant capacity of 13 apples. A consortium of U.S. government agencies such as the Centers for Disease Control (CDC), USDA, and the FDA to put out guidelines on fruit and veggies and serving size. The result is that 4 ounces of MonaVie is a Serving of fruit which looks like 1 snack container of applesauce (4oz) or about 6 baby carrots. At MonaVie’s retail price of around $6.00 for four ounces that’s like buying a baby carrot for $1.00! If you need a little more evidence on the nutritional value of MonaVie, Men’s Journal put several fruit juices to the test using criteria set up by a director or clinical nutrition. The result was horrendous, “MonaVie tested extremely low in anthocyanins and phenolics. Even apple juice (which also tested poorly) has more phenolics…” and “Plus, MonaVie’s vitamin C level was five times lower than that of Welch’s Grape Juice. That’s not many nutrients, especially at $1.20 a serving.” Website changes have divided the article into many pieces, but the you can read it in two parts: part 1 and part 2 with the MonaVie-specific comments. What do national doctors have to say? Dr. Andrew Weil gives a thumbs down on MonaVie, Dr. Dean Edell calls MonaVie worthless, and Dr. Joe Schwarcz warns against acai health claims. These are all unbiased, nationally-recognized doctors. Those claims that he’s referring to are the illegal health claims that we’ll get to in a bit. Another aspect to consider is that juice itself is shown not to be healthy. For years we thought it was healthy, but that thinking has changed and many view soda and juice as being the same. The HBO documentary Weight of a Nation clearly spells this out. When we take the statements above together, juice the same as soda, soda having less nutrition than a potato chip, it is clear that MonaVie can’t be nutritious. The processing has stripped out the fiber… the good part of the fruit. Some may argue that MonaVie is only four ounces a day and it’s not going to contribute to obesity. Well that 120 calories a day does add up… in a year it is 12.5 pounds (43,800 yearly calories divided by 3,500 calories in a pound). As you can tell from the label above, MonaVie doesn’t have much of the fiber that comes from fruit naturally. Recently MonaVie started to add “fake” fiber (Fibersol-2 / Maltodextrin), so consumers looking at the nutritional label could be easily tricked into thinking that they are getting the good part of the fruit. Need another source? Here is the New York Times article by three professors of pediatrics who explain “Juice is Not Healthy”. MonaVie Active – This MonaVie juice’s star ingredients is glucosamine. In four ounces of MonaVie Active there are 1500mg of glucosamine. On Amazon.com, I found that you can get 375 tablets of Kirkland Glucosamine HCI for a price of $22.55 (as of 6/8/2012). It takes two tablets to equal the 1500mg of glucosamine in MonaVie Active, which comes out to 12 cents a day. For a year, the Kirkland glucosamine will cost you $43.80. For a year of MonaVie Active (4 ounces * 365 days = 1460 ounces is about 58 and half bottles (25 ounces per bottle). At the retail price of $45 a bottle, 58 bottles costs $2,610 a year. You can save some money by buying MonaVie Active in bulk, but you’ll never get the price under $1000, especially with shipping. You’ll save at least a thousand dollars, perhaps two thousand by going with the equivalent cheap solution from Amazon or your local drug store. With this noted, scientific research shows that it probably is not worth buying glucosamine at all. MonaVie Pulse – This MonaVie juice’s star ingredients are plant sterols and resveratrol added. In four ounces of MonaVie Pulse there are 0.8g of plant sterols. I couldn’t find the amount of resveratrol. On Amazon, I found CholestOff, which actually has 0.9g of plant sterols. The 240 tablets, 120 servings, costs $22.22, which is 18.5 cents a day or $67.59 a year. MonaVie Pulse is typically the same price as MonaVie Active above (around $2610, but cheaper if bought in bulk) and it too will cost you thousands more than the much obvious cheaper solution. What about the resveratrol? Without knowing how much is in MonaVie Pulse, we can’t really make a fair price comparison. There is this resveratrol, which will cost you $76.19 a year. The combination of CholestOff and this resveratrol is still a bargain at around $140 compared to spending a couple of thousand dollars and not knowing how much resveratrol you’ll get. While plant sterols have been shown to the FDA to help cholesterol levels, resveratrol remains and unknown… A couple of articles show that we might need to wait for legit evidence on resveratrol. MonaVie M(mun) – This MonaVie juice’s star ingredient is Wellmune, a patented derivative of baker’s yeast from the pharmaceutical company, Biothera. Four ounces of MonaVie M(mun) has 250mg of Wellmune in it. Once again, I went to Amazon and found Immune Health Basics, which has 500mg of Wellmune. It costs $37.49 for 60 capsules or about 62.5 cents for 500mg. Since this is double the amount in MonaVie, the true cost per serving would be a little more than 31 cents. It costs $114 for a year’s supply of the same amount of Immune Health Basics as you’d get in MonaVie M(mun). The pricing of M(mun) follows that of MonaVie Active and MonaVie Pulse above, meaning that you’d save thousands by buying the capsules of Immune Health Basics. When you do a little more research you’ll find that Wellmune is also similar to beta glucans, a pill that you also might be able to find cheaply. When I last looked into Wellmune, around the time that MonaVie announced M(mun), research as to whether it was helpful was conflicting. One study of people found that they missed no more sick days than the placebo group when taking the product. MonaVie MX – This MonaVie juice has the star ingredients of Active (glucosamine) and M(mun) Wellmune. Also, in addition to the basic 19 fruit juices in the juice it has 11 vegetables. Below, we’ll cover in more detail why this isn’t necessarily a good thing. As for pricing, this product like all of MonaVie juices is around $40, but in this case a few extra dollars due to having the glucosamine and the Wellmune in it. MonaVie Essential and MonaVie Kosher – MonaVie essential seems to be a rework of “MonaVie Original” which is the basic juice with no star ingredients. MonaVie Kosher is a basic juice with no star ingredients that has been certified Kosher. Bottom Line on MonaVie Nutrition: Any way you slice it (pun intended), MonaVie is not a good source of nutrition when compared to time-tested advice of just eating fruits and vegetables. If you are thinking about MonaVie as a dietary supplement, it represents the worst value for you dollar… and it isn’t even close. The examples I gave of a single person spending thousands more than equivalent product is multiplied when you consider a family of four. That family could save an average of over $6000+ a year by replacing MonaVie’s juices with products found in your drug store or on the Internet. Depending on your tax bracket, this simple decision could be the equivalent of getting a $10,000 raise tomorrow or winning a lottery that pays you $10,000 for life. Around 99.54% of People Lose Money in MonaVie – This analysis was done using MonaVie’s Income Disclosure Statement (IDS) the last time they included the number of distributors to make such calculations possible. No Barriers to Entry – Since anyone can be a distributor for usually very little money, anyone can be your direct competitor. Below we’ll get to the point about MonaVie and pyramid schemes. We’ll cover how “creating a sales organization in MLM” can be considered as participating in illegal pyramid scheme. MLM and the Reality of Saturation – Recruiting people into MonaVie is where the Diamonds make their money. The problem is that the market is already saturated. You simply can’t go to the top of the pyramid anymore because those positions have been taken for years. In order to get there you have to build thousands of people under you and if those people wanted to be juice salesmen they would have been long before now. Understanding the Churn Rate in MLM – Somewhere between 60% and 90% of distributors in MLMs leave the business every year because of the first bullet point above. They didn’t make any money. MLMs replace these people with new hopefuls because their sales pitch is enticing. When MonaVie recruits someone they tell them that they too can have health and wealth for them and all their friends. Who wouldn’t want that? The scheme churns through people every year with enough people quitting and joining so that the pyramid scheme never explodes past the population of the earth. MLM distributors like say that it is up to the person to do the work and not be “Lazy.” Well I’m an expert on Lazy and I can tell you that isn’t the truth. In MLM, losing is not a matter of effort, it’s a mathematical certainty. The circumstances surrounding the system set people up to fail. When I first wrote about MonaVie and wondered why people would spend $45 on juice, I had no idea how the product was marketed. I was shocked as distributors left comments connecting MonaVie to helping with cancer, autism, fibromyalgia, and just about any and every other medical condition under the sun. MonaVie has not been approved by the FDA to help with such conditions making these claims illegal. It wasn’t until later that I learned that MonaVie CEO was the Vice President of Dynamic Essentials a company that madeRoyal Tondan Limu juice. The FDA warned the company about website claims to treat various diseases such as cancer, arthritis, and Attention Deficit Disorder caused their products to be in violation of the law. The company continued to sell the product and the FDA and Department of Justice fined the company millions and went as far as destroying the product. The action essentially put an end to Dynamic Essentials. Dallin Larsen held “fireside chats” with hundreds of people. There is one “fireside” chat on Archive.org. He tells this convincing story how Dynamic Essentials is part of a publicly traded company with products in Wal-Mart and that they found this fascinating ingredient called Limu Moui. He goes on to essentially claim that limu that unique benefits to help with the system. At the 7:25 minute mark of the audio, Larsen tells of how he just came back from a tour talking to people who have used the product and tells of the stories he heard and how it has helping with asthma, arthritis, chronic fatique, fibromyalgia, lupis, migrane headaches, etc. He then goes to say that “We can’t make [the claim that you aren’t going to get cancer and heart disease]… I know that this product is having a benefitial impact on people’s health. MonaVie, is an identical copy-cat of Royal Tongan Limu juice, but with acai instead of limu. The illegal health claims that I’ve seen in the comments on my article and elsewhere on the Internet come straight from the leadership. Newsweek did a story on MonaVie in which Dallin Larsen acknowledged that while MonaVie has an 18-person compliance team which investigates distributors making false claims, “It’s next to impossible, like herding cats.” In short, MonaVie opened Pandora’s Box with their distribution system. The proper solution to fix this systemic problem is to distribute the product like Ocean Spray or Welch which doesn’t have these problems. MonaVie refuses this logical solution that would prevent consumers from be defrauded out of their hard-earned money and still allow them to get the product to those who were interested in it. When I found MonaVie distributor Mitch Biggs claiming that MonaVie prevents swine flu, I decided to help out MonaVie’s compliance team and let them know. Mitch Biggs should know better. He was a MonaVie Emerald Executive, one of the top 166 distributors at the time, who make an average $155,000 a year. My goal was to find out how MonaVie would enforce the its policies and procedures which allow it to end a distributorship who is caught making illegal claims. Would MonaVie do what’s right and make an example to show distributors that they can’t be making these claims? Or would MonaVie cave, not wanting to create a rift amongst its distributors? The answer: Mitch Biggs Scams People and MonaVie Condones It. A recent commenter suggested that MonaVie’s compliance was doing its job, so I showed him this story, which is about two years ago as of this pointing (June 2012). I decided to go an look and see if MonaVie is still letting Mitch Biggs be a distributor, which lead me to this video on a local news show. It seems like Mitch and Ashley Biggs are making erroneous and deceptive claims multiple times saying that MonaVie is an “easy, convenient and tasteful, way to get your fruit every day” and “just an easy, easy, way to get your fruit.” As we saw in a section above, MonaVie’s Nutritional Value, this is quite untrue. The spot even took the effort to bring a vase of 13 fruits to illustrate the deception. It may seem like I’m picking on one distributor, but this is a leading distributor who was made an example of once before and yet continues to break the law publicly. If this is the stuff that is going on in the open, imagine what is going on behind closed doors! Some may suggest that this is an isolated case – one example of a bad seed that every industry has. That’s simply untrue. It is a systematic problem which is so prevalent that Dr. Johnny Bowden’s article that I mentioned at the very beginning of this article was titled, “No More Claiming MonaVie Cures Cancer!” These are the kinds of things that happens when you tell distributors that they can be millionaires if you recruit enough people to buy a juice that happens to be priced at 20 times more than other juices. The distributors have to come up with some way to market the obscenely overpriced product. They are naturally going to try to make a point that it is a value for consumers as a replacement for medicine or something seemingly expensive like buying a vase of 13 fruits. 19 fruits in the juice – MonaVie adds all these juices because the public has a perception that more juices is better. That’s not necessarily true. Regular readers know that a mutual fund with more stocks does not necessarily out-perform those with fewer stocks. A pizza with a 7-cheese blend is not necessarily better than one with a 3-cheese blend. In fact, the more ingredients, the easier it is to dilute the ingredients that MonaVie touts like acai. 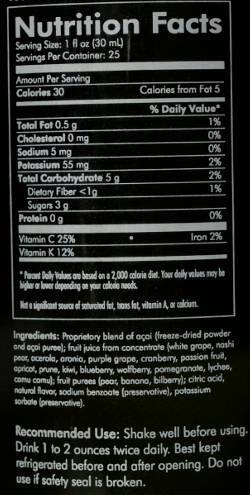 When you have 18 other fruits in addition to acai, the amount of acai could be less than 6% and still be the first ingredient on the list. However, if MonaVie only had 2 fruits and acai was listed first, you’d know that you are getting at least 50% acai in every ounce. Freeze-dried acai – For years MonaVie touted the amount of freeze-dried acai because it had a huge ORAC score. The reason it got such a high score is the fact that water was taken out, which allowed them to pack more powder per ounce. However, it was shown that MonaVie is less than 2% freeze-dried acai, meaning that even with a high score, there wasn’t enough of it to make a significant difference. MonaVie relies heavily on their Scientific Advisory Board, specifically Dr. Alexander Schauss. Schauss has a long list of reputation problems. One of them was that he faked his credentials and got a mail-order PhD degree from California Coast University. MonaVie pitched Schauss as an expert on acai, but they are the only ones who recognized him for anything like this. The reality is that Schauss was the supplier of his OptiAcai brand to MonaVie. Schauss, through his AIBMR Life Sciences, pumped out a lot of “research” which could fool some people into thinking that there was actual science. In fact, MonaVie product specialist Erica Bryant wrote distributors to tell them that AIBMR is the only source of that they should use. Some of this research led to ridiculous papers such as this “Double-Blinded, Placebo-Controlled Study” on MonaVie by Schauss. It doesn’t take a scientist to see that it was made for the specific purpose of giving distributors fuel to recruit more people. Tellingly, the final conclusion of the study made mention of another study that showed that eating fruit had positive results as well. MonaVie: An Illegal Pyramid Scheme? When a distributor satisfies the requirement by (A) buying product for themselves and MonaVie pays a commission to the upline on that purchase that it can be considered a pyramid scheme using the FTC’s guidelines. This is the typical way that requirement is satisfied. The distributor application for MonaVie prominently includes the Auto-Ship Program (ASP) so that new distributors can satisfy the active by buying product requirement right away. The option (B) to qualify as active by recruiting enough preferred customers, is a new option. Previously the only method was the above option A) which makes it quite clear that MonaVie could only be viewed as a pyramid scheme. With the new option (B) it becomes a little more complex. Since (A) is a sign of a pyramid scheme, we need data from MonaVie on the percentage of distributors that qualify through the (B) option. (MonaVie doesn’t disclose this information.) Anecdotal evidence tells me that the (B) option is quite rare. As explained in the above section, MonaVie’s Nutritional Value, MonaVie’s juices represent a poor product at an extremely expensive price (approximately 20 times the price, ounce for ounce, of other 100% fruit juices). In the rare case that a preferred customer is buying the product, it is mostly like that they were sold on the illegal medical claims or deceptive marketing, as described in the section above. People are brainwashed from the beginning that the system “works”, and “the only variable is you.” Thus people feel as if it is their own failure rather than recognizing the system was mathematically set up to fail over 99% of people from the beginning. The FTC doesn’t do anything. You leave a complaint and that’s the end of it. The complainant gets no follow-up from the FTC and there’s never any evidence that the complaint is ever read. It’s fundamentally terrible system… but that’s what we have to work with. With that said, if you’re as upset as I am about people being lied to and defrauded out of their money, please leave a complaint. If you do, please sent me a quick mail. This way, I’ll have an idea of the minimum number of complaints that MonaVie is getting. Update: MonaVie has started marketing to college students and those who have recently graduated. These are probably the worst candidates for such overpriced MLM products. They have little income and often high student loans. I believe that MLMs have nowhere else to turn as the general population know that it’s a scam. I think they believe they will catch them early before they’ve gathered the wisdom to know to stay away. I wrote a whole article about MonaVie Mynt.